Cape Town Cruise Specials - Currently there are up to 40% discounts on early bookings for the 2019/2020 season. Kids go free, senior discounts, group booking discounts, etc. Klik hier vir die Afrikaanse weergawe can hierdie webblad. Send us a review and photographs of your cruise from Cape Town & earn cruise vouchers. Durban has the warm water, but imagine gazing upon Table Mountain from aboard a ship with a cocktail in the hand! :) You have the choice of six ships that you can book a cruise from Cape Town on : Azmara Quest, Regent Seven Seas Explorer, Cunard Queen Elizabeth, Cunard Queen Victoria, Crystal Cruises Symphony, the MSC Musica and MSC Orchestra. Over the last few seasons we have said our goodbyes to the MSC Opera, and more recently the MSC Sinfonia which was here until April 2018. The MSC Musica will visit until April 2019, and the MSC Orchestra will come in the 2020/2021 season (for those who like booking way in advance). Silversea's The Silver Spirit cruise ship is an ultra-luxury vessel for those that prefer a smaller number of passengers. 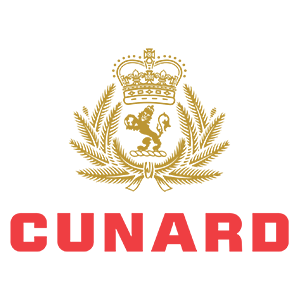 The Cunard Queen Elizabeth provides cruises to international destinations. Cape Town to St Helena Island. Cruise tip: Make 100% certain that you attend the sailaway party on your departure from Cape Town, as it offers the magnificent backdrop of Table Mountain. 9 January 2018: The Department of Home Affairs together with SA immigration will be implementing their new Biometric System which will apply to all passengers who will be embarking on the 9th of January 2018 departure. The Biometric System will be rolled out at the Cape Town terminal as part of this new pilot project. The Biometric data capturing process, which is integral to the success of the project refers to the capturing of anatomical or physiological data by which a person can be uniquely identified - in this case your fingerprint data will be captured at the port when you begin the embarkation process. Please be aware that the embarkation process will be delayed due to this new system and we thank you for your patience in advance. 19th January 2015: The MSC Opera is unable to enter the port of Cape Town, due to strong winds. 17th March 2014: The MSC Sinfonia sails from Cape Town for the last time, on her way to Genoa. She is not returning to South Africa's shores for the 2014/2015 cruise season, instead she's heading to the dry dock to be stretched and have 200 cabins added. 28 Feb 2014: With only a few weeks left before the Sinfonia leaves the Cape waters to go back to Italy, people are still trying to find cabins onboard this old favourite. There are still some open spots. Pop us a mail or fill in the form above to enquire. 27 Jan 2014 : The Queen Mary 2 arrives in Cape Town in the morning, docking at the Eastern Mole. It's great that she's here, but a pity that she couldn't dock at the V&A Waterfront. No surprise that Alan Winde (toursim MEC for the Western Cape) said that he was hoping that construction on Cape Town's dedicated terminal begins this year. The Queen Mary 2 leaves Cape Town for Durban on Wednesday the 29th January 2014. 17 March 2014. The MSC Sinfonia embarks on her last cruise from Cape Town, a repositioning cruise to Genoa, Italy. For the 2014/2015 season, MSC Cruises are sending only the MSC Opera to Cape Town's waters. 11 November 2013. The MSC Opera arrives in Cape Town to being the 2013/2014 South African cruise season. December 2012. It's reported that the Transnet National Port Authority will, in 2013, proceed with a "request for proposals" to build a permanent cruise liner terminal at E-Berth in Cape Town harbour. 2013. Amanda wrote a review of her CT to Durban cruise, which she did with the rest of her family. She recommends taking an official excursion into PE, booking an outside cabin and not to be put off by the pricing in US Dollars. 2013. Catharina sails from CT to St Helena Island : "We were amazed at the rich history the island has and the tourist highlights we managed to see in the short time we had available." P&O Cruises offers cruises from Singapore to the Cape. Whereever in the world you may be, SouthAfrica.TO are at the ready to book a cruise from Cape Town for you. A CT travel agent wrote to tell us : "My client told me that many passengers disembarked in Cape Town and went straight to the airport to fly out again – without spending any time here at all! There was a small group that was spending just the day here and flying out in the evening. This is very strange." So if you're on a flight to Cape Town for the cruise, do spend some time touring around the city, or else you're missing out on half the adventure - see our CT day trips page, if you're short of ideas. Cruise ships generally dock at E-Berth in Duncan Dock (see map below). There is parking in the vicinity, although it gets pretty full on the day of a cruise, so you are advised to arrive early. The Transnet National Ports Authority has budgeted R3billion to build a new passenger terminal in 2014, which is better located. 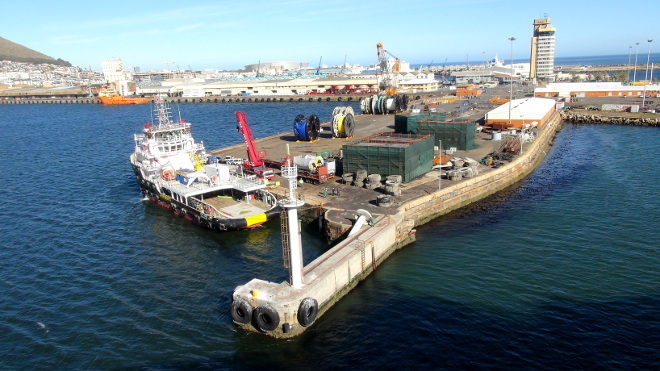 On the 23rd September 2013 the Chief Executive of the Waterfront, David Green, said that they are preparing a bid for the new Cape Town cruise terminal to be at the Waterfront - they're submitting their bid in October 2013, after which Transnet Ports Authority were meant to spend 5 months deciding which bid to go with. The Waterfront believe they can increase their contribution to South Africa's GDP by 51% if they're allowed to develop a cruise terminal at the Waterfront. On 1 July 2015 Transnet National Ports Authority announced that the V&A Waterfront was the preferred bidder for the Cape Town cruise terminal. The V&A Waterfront will be responsible for operations, maintenance, and will transfer ownership back to the Transnet National Ports Authority in 2035. The cruise terminal is expected to be completed by Dec 2017. The Port of Cape Town is situated in Table Bay and is managed by the Transnet National Port Authority. The port manages the most fresh fruit in South Africa. It has an impressive backdrop of Table Mountain and the Cape Town city, and part of it forms the Cape Town Waterfront, a major tourist attraction. 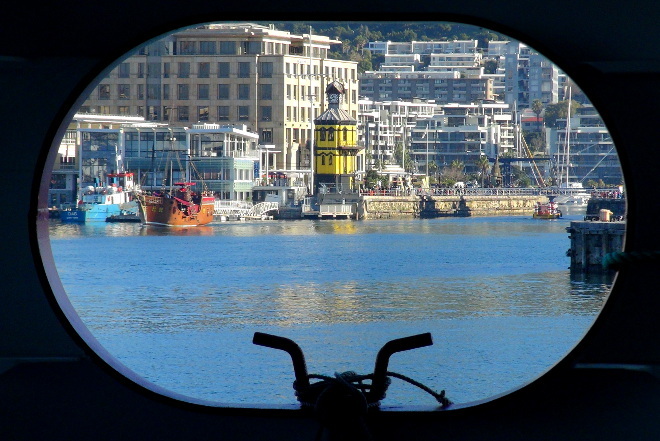 There are some impressive hotels in the harbour area, like the nearby Cape Grace (the closest hotel to E-Berth), and these are well worth a visit before or after your cruise. Because of the strong south-easterly win in summer months, the harbour is sometimes closed to ships entering and exiting - which poses obvious challenges to passenger liners. The port is also home to the Royal Cape Yacht Club. The establishment of the harbour in Cape Town dates back to the 6th April 1652 Jan van Riebeeck & co arrived in Cape Town to set up a resupply station for ships travelling from Europe to the East. In 1882 the Robinson Dry Dock was completed, and is today the oldest functioning dry dock worldwide.